The Magic Shop is described as "retail store services in the field of entertainment, not involving magic, featuring pre-recorded audio and audiovisual works for use with virtual, augmented and mixed reality technology hardware, provided via the internet and other computer and electronic communication networks." The Magic Shop: Retail store services in the field of entertainment, not involving magic, featuring pre-recorded audio and audiovisual works for augmented and mixed reality technology hardware. From that description, it could be that The Magic Shop will only refer to the company's online sales portal. But what if this is also the name for the possible brick and mortar shops? We can dream, can't we? Who wouldn't want to walk into a store dedicated to augmented reality hardware and software called The Magic Shop? Yet another, more recent filing lists "Magic Leap World" as an "online retail store services featuring computer software programs and computer games." But Magic Shop sounds so much cooler. However, The Magic Shop name (along with the subsequent names mentioned here) is still in the trademark application phase, so there's no guarantee that Magic Leap will have the name approved or if the company will even decide to use it. One of the most interesting things about Magic Leap's NBA partnership announcement last month was the fact that one of the biggest humans on the planet, NBA star Shaquille O'Neal, was shown comfortably wearing the Magic Leap One. That reminded us of something that Magic Leap claimed during its initial Dec. 2017 product reveal — that the device wouldn't be restricted to a certain group of people based on size. A look at a recently updated trademark application filed by Magic Leap describes an accessories system called Fit Kit. According to the filing, the Fit Kit refers to "headset accessories, namely, headset cushions and headset pads used to correct virtual, augmented and mixed reality headsets to the appropriate size of the user." So whatever size your noggin is, small or large, you'll likely be able to wear the Magic Leap One comfortably. 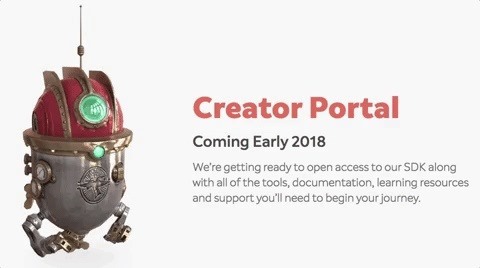 When I had a private meeting with a Magic Leap executive in New York in 2015, I was told that a developer's conference focused on the company's platform would be launched in mere months, sometime in the summer of that year. Years later, there's still no official developer's conference date announced, but we may have a name: L.E.A.P. Creator Conference. Based on trademark application filings, this could be the name accompanying the Magic Leap developer's conference when it does finally launch. The event is described as "educational services, namely, developing, arranging, and conducting educational conferences and programs and providing courses of instruction in the field of software development for mixed, augmented and virtual reality." Finally, the coolest part (next to the retail name) of Magic Leap's apparent branding approach is related to the company's software development kit (SDK). You've probably already guessed what it's called. That's right: The Magic Kit. The company describes The Magic Kit as "providing educational training, namely, online tutorials in the field of use of software development kits (SDKs)," and "software as a service (SaaS) featuring software development tools and access to open source software to be used in connection with software development." Another filing, updated earlier this month, points more specifically to the name Lumin as the name of the company's SDK, so it's possible that Magic Kit may just refer to tutorials related to the SDK. Whichever name Magic Leap finally picks for its SDK, Magic Kit is an awesome name and, just based on its branding and the implications of that branding (that is, AR = magic! ), it could inspire some newbies to begin tackling software development. In the end, after coming up with your product, branding it properly is vital to its success, particularly in the age of social media-fueled continuous partial attention. And while we still have yet to see if Magic Leap's hardware and software lives up to the hype, so far, it looks like the company is getting the branding part right. Again, none of these trademark applications are confirmation that Magic Leap will actually use these names, but if most of them make it to market, AR is about to get a lot more "magical."